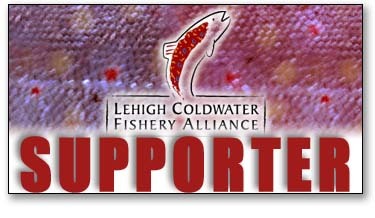 A fantastic tool for influencing your decision on where to fish the Lehigh is back up and running. The LRSA Temp Probe which has been out of action for a little while is back up and running. The gage is located below the Gorge, and just upstream of Jim Thorpe. What is impressive to note since the probe has been operational is the water temps it has been registering compared to what has been coming out of Francis E Walter Reservoir. Most rivers warm as they travel downstream away from their headwaters. But not the Lehigh. It remains a consistent temperature or even cools. Fishing in the Gorge should hold up well over the holiday weekend as the water levels continue to drop. The fishing up that way continues to hold up very well. I think it is safe to say that with the consistent coldwater water release of 500cfs, the fish and bugs have settled into a pretty comfy routine. All the usual spots that you've caught fish in year after year are holding fish, but they are getting a bit picky by this time of year. There is no doubt that the no-kill stretch fish probably have a PhD by now. 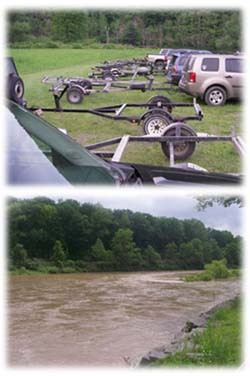 With 600cfs on the gage at Hale Eddy wade fishing is really the way to go. Sure you can float the West Branch at this level but we tend to find it a bit low for that Stalking fish in the mid-day hours with an isonychia dry in the chop will always drum up fish this time of year. And in the evening look for red brown spinners or hatching sulphurs. This outing though we had some sort of grey fox looking dun that hatched late-morning into early afternoon, which really lit up the fishing. A well presented dirty sulphur did the trick for most of the fish we saw pop for these bugs. Otherwise, a sulphur imitation in yellow or orange also did the trick. Most of the fish we got into were rainbows, which was most likely dependent of the water type we were fishing. Broken water with chop tends to hold more bows than browns. However, we did get into a handful of browns. Highlight though were the screamer bows. Man, are they fun! Finally, we hit the Lehigh. 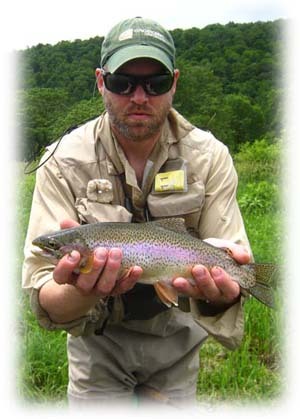 Amazingly the season till this point has not lent itself to decent conditions on the Lehigh. There has just been too much water, with an extremely limited window of conducive fishing opportunities for the floater. And almost non-existant opportunities for the wade angler. But this past weekend provided a small window - 1,600 cfs on the Lehighton gage - and so we decided to try it out. We put-in at Bowmanstown in the afternoon amongst the tubers and the plastic hatch and did a somewhat rushed float to Walnutport. Immediately, we found rising fish, tight to the banks. We had olives on the water, and the fish were on them. Usually with the Lehigh you don't find fish in such technical locations, but on this trip, the fish were in the tricky spots that required decent casting skills. We also came across some trout along the way that were somewhat selective. This made for a fun trip. All in all, the fish we got into were in great shape with only a few easily identified as recent stockies. The remainder of the trout we landed were either grown-up unclipped fingerlings or wild fish. We also landed a few very small - <5" - wild looking trout with clean fins. By far the most prolific bug on the water was the large drunella olive. From late afternoon thru dusk they were on the water. However, during that prime time magic hour where you expect to see the summer sulphur, there were none. We did spot a few cahills though. If there was a disappointment to the float, it was the lack of bugs during prime time. Things are still looking good on the Lehigh. Get out if you can as the fish are healthy looking and are readily eating the well placed dry. We hit it good. The flats fishing was off the charts for a few days, and the late afternoon bluefish bite was every cast on a couple of days as well. Of course, we also got into a bit of night-bite bass action. Which is typical for MV in June. All of the above said. The highlight of the trip was by-far the flats bass bite. One day in particular we had hundreds if not thousands of bass stream by us in knee-deep, crystal clear water. It was insane! The visuals were killer!!! Cast and strip as fast as you can, then pause, and strip faster. That was the key. White deceivers! Despite the numbers of fish and competition, not all ate. In fact the number of follows and non-eaters was amazing. But when they ate, it was off to the races. All fish were decent size - - and covered in sea lice. Other than that, we got into the standard evening low light bass bite and late afternoon blue bite. We slayed blues on spin. It is that time of year for our annual Martha's Vineyard trip. It is hard to believe that it is already here - - where did the year go! What this will bring is anyone's guess. Will we have blues rolling with the tide during the day? Will the bass be at our feet gorging on sand eel? Will we find fish in a new location, or will the old stand-bys produce like they have in the past. We shall soon find out. Can't wait! Be sure to check back in like a week or so for a recap! Until then, the website will be silent. Magic hour on Cape Poge! One part of FFPA managed to make it up to the West Branch over the holiday weekend. As is usually the case with the Upper D system, this holiday weekend brings out hoards of anglers (see top photo to right). 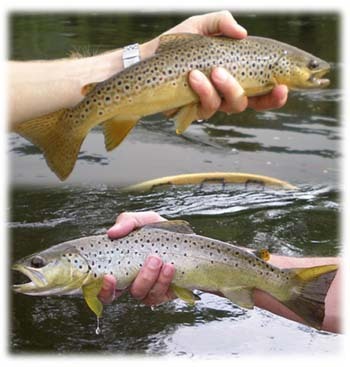 Not helping matters were the relatively warm water temps - for this system at least - which concentrated the majority of anglers on the upper West Branch. With the high sun all weekend, the key was to get on the water early, before the sun got high in the sky. Once that big brite ball got on the water, the fish hunkered down. Those who did manage to make their way to the water in the wee hours of the day were rewarded with some streamer fish, as well as rising trout eating the left over spinners from the night before. However, it is safe to say these fish are streamered out. They've been seeing a lot of big white bunny flies. For the evening action, it really blew up right at dark. You had to be rigged and in your spot when the sun went down in order to cash in on the flurry. For the most part sulphur imitations did the trick. However, there are still some left over march browns and the start of the green drakes. Imagine the drakes are in full swing right now. Unfortunately the end of the weekend was capped off by a deluge that muddied up the West Branch big time. I am sure it ran off relatively quickly, but man was it as mess on Monday morning (see bottom photo to right).